A comparison of the standard list of Safari tabs to Bento's search-and-organize process. Source: "Bento Browser: Complex Mobile Search Without Tabs," by Nathan Hahn, Joseph Chee Chang and Aniket Kittur at Carnegie Mellon University. A mobile browser developed at Carnegie Mellon University offers a better search experience for people doing complex searches across multiple websites, such as those planning a vacation or exploring medical treatments. The app offers the promise of replacing the overwhelming tab management required by iPhone's default Safari browser. The Bento browser, as it's called, compartmentalizes search sessions into a project workspace structure. The user can even keep track of the most relevant parts of a web page. And the websites don't need to stay open between viewing sessions. Created by researchers in the Human-Computer Interaction Institute at Carnegie Mellon, Bento allows users to store projects for later use, hand them off to others or move them to different devices. For example, a person planning a trip to Europe could do a search on various topics, then identify the pages they found useful, delete unhelpful pages and mark up what they have read on each page. Bento will bundle the search results into task cards that can be organized by topic: accommodations, day trips, transportation, etc. Those could then be shared with others planning their own trips. "This is a new way to browse that eliminates the tab overload that limits the usefulness of conventional browsers," said Aniket Kittur, associate professor at the institute, in a press release. Kittur was joined in the project by Nathan Hahn, a Ph.D. student in the institute, and Joseph Chee Chang, a Ph.D. student in CMU's Language Technologies Institute. Hahn and Chang served as lead authors on a paper about Bento, recently presented at the CHI 2018 conference in Montreal. 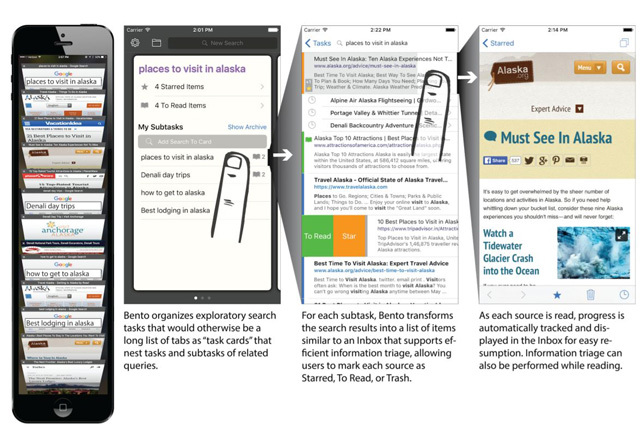 The research team ran user studies to compare Bento to the Safari browser. While Safari was simpler for people to pick up and use, Bento was the preference for searches where the users wanted to come back later and continue where they had left off and where searches needed more organization. Currently, the browser is available in the Apple App Store as a research edition, which asks users to allow their searches to become part of research data. The goal is to continue developing Bento to complement the way the mind works, according to Kittur. "If we get a lot of people using it, Bento could serve as a microscope to study how people make sense of information," he said, possibly leading to "a new type of artificial intelligence." Learn more at the Bento site.